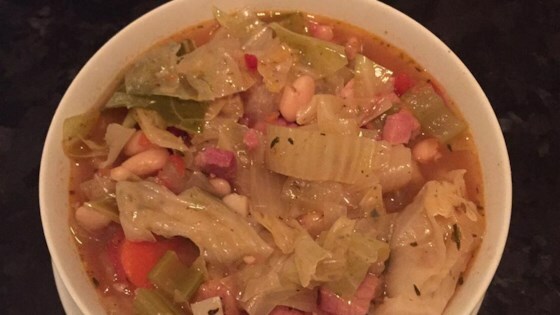 "One of my family's favorite soups. Great on chilly days. For bean lovers, add a second can of white beans." Heat olive oil in a soup pot over medium-high heat. Cook and stir onion in hot oil until tender, about 5 minutes. Season onion with Italian seasoning. Continue to cook and stir for 1 more minute. Stir chicken broth, white beans, tomatoes, cabbage, ham, and celery into the pot. Bring to a boil, then reduce heat to low; simmer until celery and cabbage are tender, 15 to 20 minutes. Beans simmer slowly with a ham bone and plenty of seasonings. I followed the recipe exactly. The flavors do not compliment one another. Delicious!!! Try using fresh ingredients and making the beans rather than canned, less sodium. Great soup! This was really delicious! A quick and easy way to use up leftover ham. Really easy to put together and the flavor is amazing! Very. Good. Had ham in the freezer leftover from Christmas. We will definitely try this again. This is easy and delicious!